'Colonel Roosevelt' may describe a denouement, but Teddy still heaped his plate full, and with passion. He could eat 12 fried eggs at a sitting. He had “a profound enjoyment of anything rocky, slimy, hardscrabble and dangerous,” as Edmund Morris writes. He was passionately fond of long expeditions to mysterious and remote regions of the world, from Africa to South America, and once there, he shot animals with gleeful abandon; lions, elephants, zebras, gazelles, pelicans and crocodiles all fell in the wake of his frenzied trigger-pulls. He seemed to gobble life as he went along, and the parts that weren’t to his taste — ideas, books and people as well as breakfast, lunch and dinner — he would spit right out. It might have been rude, but at least it was honest. During his lifetime, the rugged, optimistic and extraordinary Theodore Roosevelt (1858-1919) seemed to represent America better than anybody else. And thanks to Morris, he will do so again. Because once readers rediscover the breadth of Roosevelt’s achievements — literary and political — and the warmth of his remarkable personality, and even the failings and contradictions that made him so very human, they’ll be hooked. That quotation shows up in “Colonel Roosevelt” (Random House), the third and final volume in Morris’ splendid and indispensable study of America’s 26th president. Morris, whose biographical subjects have included Ronald Reagan and Beethoven, spent three decades on the project. “The Rise of Theodore Roosevelt” (1979) and “Theodore Rex” (2001) followed Roosevelt from his privileged yet difficult childhood — he was born into wealth but suffered through many ailments — through his White House years from 1901 to 1909. 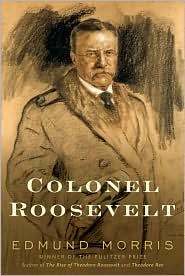 “Colonel Roosevelt” takes up the story after he leaves office. Roosevelt was only 50 and far from ready to hang up his spurs. He lusted to be back in action, and worked off his energy first in a series of trips to Africa and Europe, and later — to his profound disillusionment — as a third-party candidate in the 1912 election, losing to Wilson. Morris is a superb chronicler of Roosevelt’s busy, peripatetic life, recounting events such as the frightening day when the former president took a would-be assassin’s bullet in the chest, and the two libel trials — one brought by Roosevelt when he was falsely accused of being drunk on the campaign trail and the other brought against him by a politician whom he had insulted — against the backdrop of the ominous approach of World War I and America’s emergence as a superpower. My favorite of the three remains “Theodore Rex,” perhaps because its subject matter — Roosevelt in the White House — is so vigorous, featuring a man so obviously in his element: at the center of the action. “Colonel Roosevelt” is a record of a denouement. In an interview, Morris said that what startled him most during his research for “Colonel Roosevelt” was his subject’s literary skills. Indeed, Roosevelt was a grand prose stylist, a man who wrote with fluid grace and precise descriptive abilities. He is our finest presidential writer by a very long shot. Of the three volumes, Morris said his favorite is this final one. “The narrative sweep of his life after he left office” was dramatically appealing, he said. Abraham Lincoln may embody America’s soul, but Theodore Roosevelt has America’s heart.